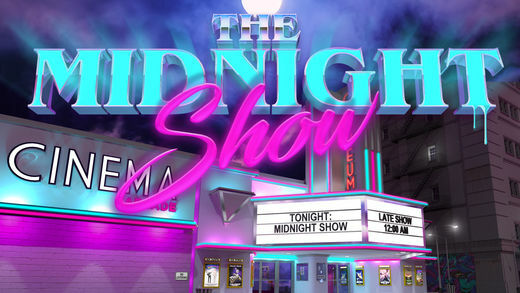 Home #IndieDev The Midnight Show – Can you escape with your soul? The Midnight Show – Can you escape with your soul? With the ascension of Stranger Things and the spotlight it casts on 1980s horror, it’s no wonder games like The Midnight Show take the player back to that synth-fueled era for a round of adventure and scares. TMS drops the player right back into an 80s vibe, by depositing them in the middle of a neon-laced cinema and arcade called “The Orpheum”. The goal is to get back from the past and into your cozy home in the present day, but to do so you will need to converse with the employees and gather the information and items needed to escape. And you’ll need to figure out the mystery of what happened before you are sacrificed for your soul. TMS drops the typical swipe method used to navigate panorama scenes, opting to replace it with a “tilt-your-own-adventure” UI that relies on the mobile device’s accelerometer. 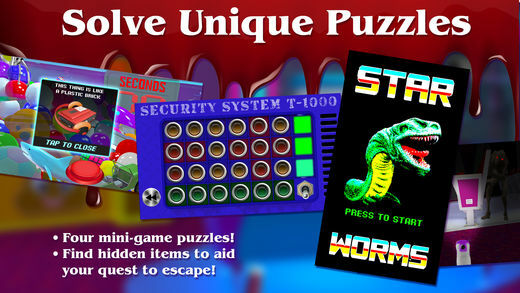 This adds a unique gameplay aspect and also keeps the player from inadvertently pressing on typical point-and-click items and obstacles accidentally. The goal of Takster Games is to keep the story moving with as little resistance as possible. Conversations also play a large part in the gameplay, as you may find it’s easier to just lie to an employee to get past them to a new area. Although many times, you will need to figure out what they need in exchange to look the other way. Much of the story is also told through conversations, reducing the reliance on prologue and cut-scenes. The rest of the story is filled in through informational items gained along the way, like newspaper clippings or scientific notes. Meeting Star, Eugene, Billy, and others, keep the focus on character, while the computer-generated beats move the game along to its finish with a lush audio atmosphere. The soundtrack features music from New Retro Wave artists Wice and ALEX and the entire game is permeated with a heavy synth sound, like something from a John Carpenter movie. The music pairs with both 3D-rendered backgrounds and hand-painted character art to create a surreal, but familiar setting – something not quite out of a nightmare, but more from an uncomfortable dream. 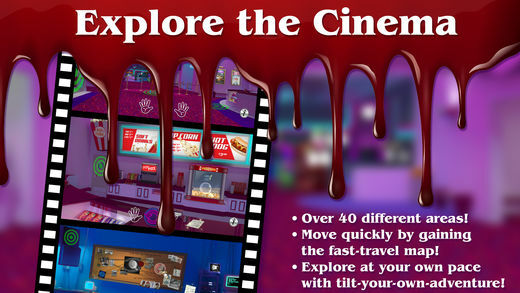 This is not a splatter or gore horror fest. TMS is an ominous slow-burn, drawing out the story in favor of quick jump-scares. There are upgrades that make the game easier over time. An inventory fanny-pack will double the available inventory and a theater map allows for quick travel to five locations within the game. Using the map makes the ever-present hunt-and-chase puzzles move with greater ease and the larger inventory carries everything needed for several tasks in a row. For adventure gamers and point-and-click lovers, there are notable changes to the formula, but enough classic elements to make it both fresh and timeless. Takster Games, LLC. is a small female-owned developer from Kansas City, dedicated to making games with three principles – Atmosphere. Character. Gameplay. Takster wants players to find new ways to solve problems, and to have deep atmosphere and character in a mobile format. There’s no reason big stories, can’t be told on small devices. This article was Published by Edamame Reviews, Written by Takster Games.